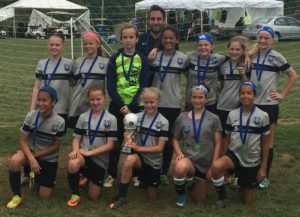 The CSC 2005 Girls Black team placed 1st in their division in the 2017 Derby Cup Tournament held in Oldham County May 29-30. In the 4 games the 05 Girls played, they scored a total of 14 goals while only allowing 2 goals. On Saturday they shut out the VGOYS (Vine Grove Optimist Youth Soccer) 6-0 and OSC (Oldham Soccer Club) 2-0. Sunday game scores were 4-1 against the Atletico Flames U11 and 2-1 against the Oldham County Soccer Thoroughbreds. Congratulations CSC 2005 Girls Black and Coach Sharma!